One of my favourite topics is robotics and automation. This page is dedicated to those passions. For those of you that have known me for the last few decades you will know of my interest in the robot soccer in particular. This section is designed to entice you to succumb to my passion and follow the story of the RoboCup federation. A story that has been going on since the late 1990’s and will likely continue for the next few decades until the goal of the RoboCup Federation is achieved hopefully by 2050. That goal is to have a team of robotic soccer players challenge, be accepted and then defeat the human world champions. 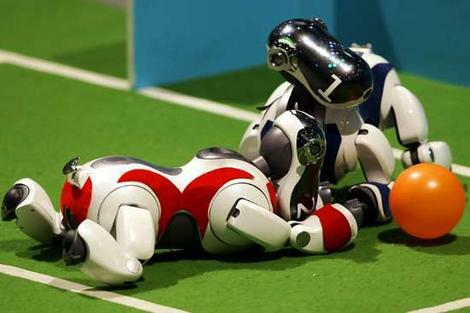 For those of you that love footy you will at least understand my passion for robotic soccer as it essentially the same! Back in 1998, myself (as team leader) and several of my RMIT colleagues participated in one of the first international robotics competitions. We flew to Paris, France carrying with us 5 precious boxes which contained our “creations”, to submit them to compete against other autonomous robots from around the world. From the moment we landed it was a sleepless existence, each time we competed our little robot champions would get “damaged” and require extensive repair work and reprogramming. Each game taught us where we went wrong with strategic programming and design of our systems. The competition required us to quickly adapt the systems before our next game. I don’t think any of us got any actual sleep for a straight 72 hours until we finally started collapsing with exhaustion. We learnt what real competition was about and took home key lessons which were feed back to the future teams that would build on our designs in future years. Unfortunately we didn’t win that year, however we did have the satisfaction of not being beaten by the Italians and we made a great impression on the RoboCup Committee, enough to get our bid for hosting the 2000 event in Australia across the line. Our passion was as strong as ever. The following year, I worked with the Australian Artificial Intelligence Institute to bring together the RoboCup 2000 event in Melbourne (or officially the RoboCup International Symposium and World Championship) That same year also involved working with my colleagues to create and start the very first RoboCup junior event, which is an event now run in about 30 countries and involves bringing the key concepts of robotic and design to high school students. I hope to one day post some of the event footage for 2000, however the original videos I had were lost in the Victorian Bushfires in 2009. Anyone reading this that has access to original footage let me know as I would love to see them again and make them available. In those early days the robots were slow and struggled to see the ball. The fields needed walls to stop them getting confused by objects beside the field. The robots operated on wheels as legs were impossibly difficult to design. Accidental destruction of other robots on the field was common and usually happened before a red flag could be issued. Watching a $100k robot being destroyed by a robot 4 times its size was another attraction for the sport! Each year the competition moves from country to country and the technological innovation improves significantly. As technical challenges are eliminated changes in the game occur to accommodate those improvements. I recall the F180 league which was small shoe box size robots running on a table tennis top. They became so fast that high speed cameras had to be brought in to capture the motion and safety nets had to be introduces to avoid human injuries from the ball being hit too hard off the field. Now days the leagues include both four and two legged robots. In particular two legged (humanoid) robots are moving much more fluidly each year. The walls of the soccer field are not needed anymore because vision systems have improved. By watching the competition each year you can see that there is a chance of the grand vision being achieved by 2050. If this really happens, at that point, robots won’t be a sci-fi concept but something real and tangible that we all will have to think about. Fortunately robots does not move at the same high speed of social development so I suspect we will all see this coming and have plenty of time to adapt to the ideas well before the robots actually reach the level of sophistication necessary to become fundamental parts of our every day lives. For now the experience of seeing such an enormous goal become reality is what the competition is all about, while the RoboCup Junior and related events serve an even greater purpose of supporting the early teaching of collaborative multi-disciplinary development which is important to advancing technologies such as robotics. The 2019 RoboCup event is planned for Sydney in July and the main organisers site is now up and running here. It has only taken 19 years to get the event back to Australia! Automation will be a topic to fill in another day but sufficient it to say many hours of coding has been spent on this area of interest for me….